Nitrogen (Azote) is an important nonmetal and the most abundant gas in the Earth's atmosphere. Nitrogen Discovery: Daniel Rutherford 1772 (Scotland): Rutherford removed oxygen and carbon dioxide from the air and showed that the residual gas would not support combustion or living organisms. Word Origin: Latin: nitrum, Greek: nitron and genes; native soda, forming. Nitrogen was sometimes referred to as 'burnt' or 'dephlogisticated' air. The French chemist Antoine Laurent Lavoisier named nitrogen azote, meaning without life. Properties: Nitrogen gas is colorless, odorless, and relatively inert. 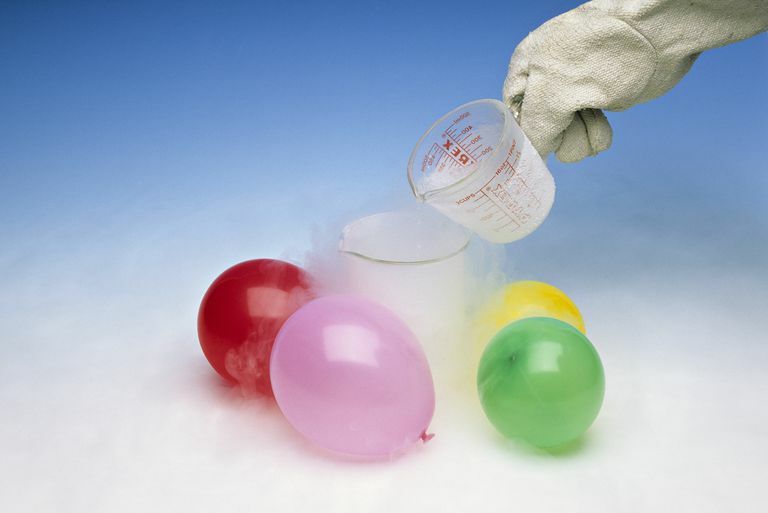 Liquid nitrogen is also colorless and odorless and is similar in appearance to water. There are two allotropic forms of solid nitrogen, a and b, with a transition between the two forms at -237° C. Nitrogen's melting point is -209.86° C, boiling point is -195.8° C, density is 1.2506 g/l, specific gravity is 0.0808 (-195.8° C) for the liquid and 1.026 (-252° C) for the solid. Nitrogen has a valence of 3 or 5. Uses: Nitrogen compounds are found in foods, fertilizers, poisons, and explosives. Nitrogen gas is used as a blanketing medium during the production of electronic components. Nitrogen is also used in annealing stainless steels and other steel products. Liquid nitrogen is used as a refrigerant. Although nitrogen gas is fairly inert, soil bacteria can 'fix' nitrogen into a usable form, which plants and animals can then utilize. Nitrogen is a component of all proteins. Nitrogen is responsible for the orange-red, blue-green, blue-violet, and deep violet colors of the aurora. Sources: Nitrogen gas (N2) makes up 78.1% of the volume of the Earth’s air. Nitrogen gas is obtained by liquefaction and fractional distillation from the atmosphere. Nitrogen gas also can be prepared by heating a water solution of ammonium nitrite (NH4NO3). Nitrogen is found in all living organisms. Ammonia (NH3), an important commercial nitrogen compound, is often the starting compound for many other nitrogen compounds. Ammonia may be produced using the Haber process. Isotopes: There are 16 known isotopes of nitrogen ranging from N-10 to N-25. There are two stable isotopes: N-14 and N-15. N-14 is the most common isotope accounting for 99.6% of natural nitrogen. Appearance: Colorless, odorless, tasteless, and mainly inert gas. Return to the Periodic Table of the Elements.